Now let's get your AWS Managed Microsoft AD ready for the trust relationship. Many of the following steps are almost identical to what you just completed for your on-premises domain. This time, however, you are working with your AWS Managed Microsoft AD. You must allow traffic from your on-premises network to the VPC containing your AWS Managed Microsoft AD. To do this, you will need to make sure that the ACLs associated with the subnets used to deploy your AWS Managed Microsoft AD and the security group rules configured on your domain controllers, both allow the requisite traffic to support trusts. These are the minimum ports that are needed to be able to connect the VPC and on-premises directory. Your specific configuration may require additional ports be open. Return to the AWS Directory Service console. In the list of directories, take note the directory ID for your AWS Managed Microsoft AD directory. Use the search box to search for your AWS Managed Microsoft AD directory ID. In the search results, select the item with the description AWS created security group for <yourdirectoryID> directory controllers. Destination determines the traffic that can leave your domain controllers and where it can go. Specify a single IP address or an IP address range in CIDR notation (for example, 203.0.113.5/32). You can also specify the name or ID of another security group in the same region. For more information, see Understand Your Directory’s AWS Security Group Configuration and Use. For Source, specify a single IP address, or an IP address range in CIDR notation (for example, 203.0.113.5/32). You can also specify the name or ID of another security group in the same region. This setting determines the traffic that can reach your domain controllers. For more information, see Understand Your Directory’s AWS Security Group Configuration and Use. Custom UDP Rule UDP 88 Specify the Source traffic used in the previous step. Custom UDP Rule UDP 123 Specify the Source traffic used in the previous step. Custom UDP Rule UDP 138 Specify the Source traffic used in the previous step. Custom UDP Rule UDP 389 Specify the Source traffic used in the previous step. Custom UDP Rule UDP 464 Specify the Source traffic used in the previous step. Custom TCP Rule TCP 88 Specify the Source traffic used in the previous step. Custom TCP Rule TCP 135 Specify the Source traffic used in the previous step. Custom TCP Rule TCP 445 Specify the Source traffic used in the previous step. Custom TCP Rule TCP 464 Specify the Source traffic used in the previous step. Custom TCP Rule TCP 636 Specify the Source traffic used in the previous step. Custom TCP Rule TCP 1024 - 65535 Specify the Source traffic used in the previous step. Custom TCP Rule TCP 3268 - 3269 Specify the Source traffic used in the previous step. DNS (UDP) UDP 53 Specify the Source traffic used in the previous step. DNS (TCP) TCP 53 Specify the Source traffic used in the previous step. LDAP TCP 389 Specify the Source traffic used in the previous step. All ICMP All N/A Specify the Source traffic used in the previous step. All traffic All All The current security group (The security group for your directory). Now you want to confirm that users in your AWS Managed Microsoft AD also have Kerberos pre-authentication enabled. This is the same process you completed for your on-premises directory. This is the default, but let's check to make sure nothing has changed. Log in to an instance that is a member of your AWS Managed Microsoft AD directory using either the Admin Account for the domain or an account that has been delegated permissions to manage users in the domain. If they are not already installed, install the Active Directory Users and Computers tool and the DNS tool. Learn how to install these tools in Installing the Active Directory Administration Tools. Open Server Manager. 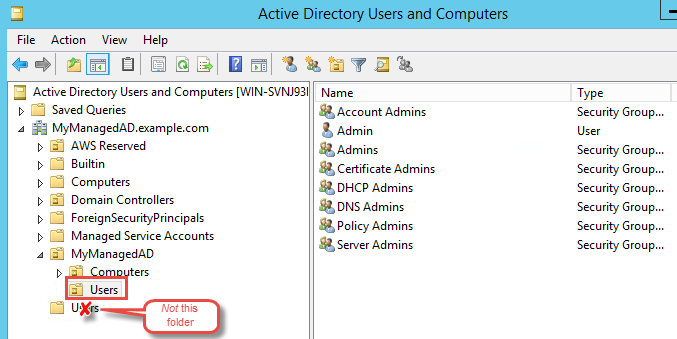 On the Tools menu, choose Active Directory Users and Computers. Choose the Users folder in your domain. Note that this is the Users folder under your NetBIOS name, not the Users folder under the fully qualified domain name (FQDN). In the list of users, right-click on a user, and then choose Properties. Choose the Account tab. In the Account options list, ensure that Do not require Kerberos preauthentication is not checked.